Chua Kian Koko and Go Kei Kei(inset), were among four people arrested following a raid in Ayala Alabang, Muntinlupa the other day. Seized from the suspects was shabu worth P1.1 billion, concealed in tea wrappers. 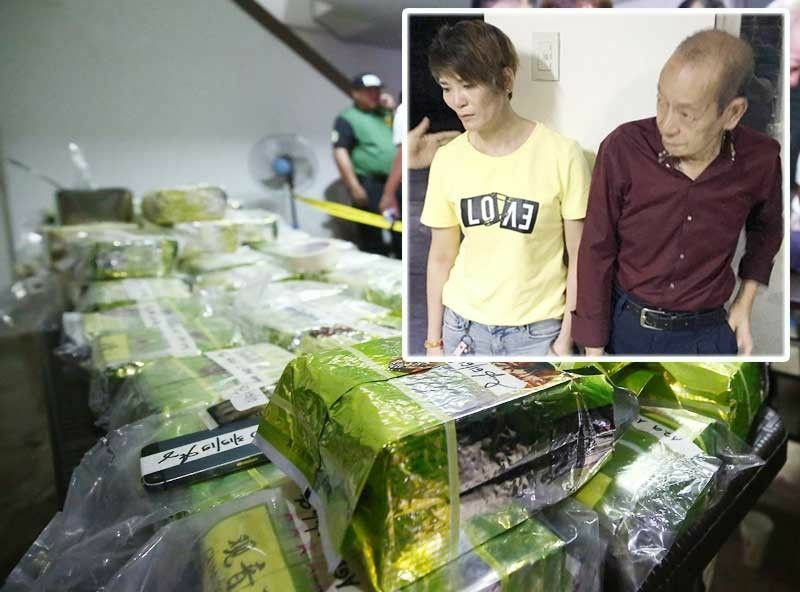 MANILA, Philippines — The 166 kilos of shabu worth P1.1 billion seized in a clandestine shabu storage facility in a posh subdivision in Muntinlupa City on Tuesday were likely smuggled through the southern backdoor, Philippine Drug Enforcement Agency (PDEA) director general Aaron Aquino said yesterday. It is possible that the drugs were smuggled into Mindanao, specifically in the Zamboanga peninsula, according to Aquino. He based his assessment on previous seizures of shabu in Zamboanga where the drugs were packaged like the ones found in Muntinlupa. The drugs found in a house along Apitong street, Ayala Alabang Village were placed in tea packs and biscuit cans. “It seems that it came from the backdoor. The Sulu Sea is being used to smuggle and the substances get in through Zamboanga,” Aquino said in an interview over radio station dzMM. The drugs are then brought to Metro Manila for packaging, he added. He said it is unlikely that the drugs were smuggled through the airports and seaports . Three people were arrested in the initial drug bust in the Alabang commercial area at around 5 p.m. They are Chinese nationals Kei Kei Go, 40; Kiak Kok Chua, 43; and their Filipino-Chinese interpreter Emmanuel Pascual, 79. The second sting in Ayala Alabang Village took place at around 6:30 p.m. where Chinese national Wu Yi, 19, was arrested. Aquino said the operation was a product of three months of surveillance on the suspects.